Built in the late 1970s, the Cambodia-Vietnam Friendship Monument is a statue located in a large reflecting pool that stands in honor of the former alliance between Cambodia and Vietnam. 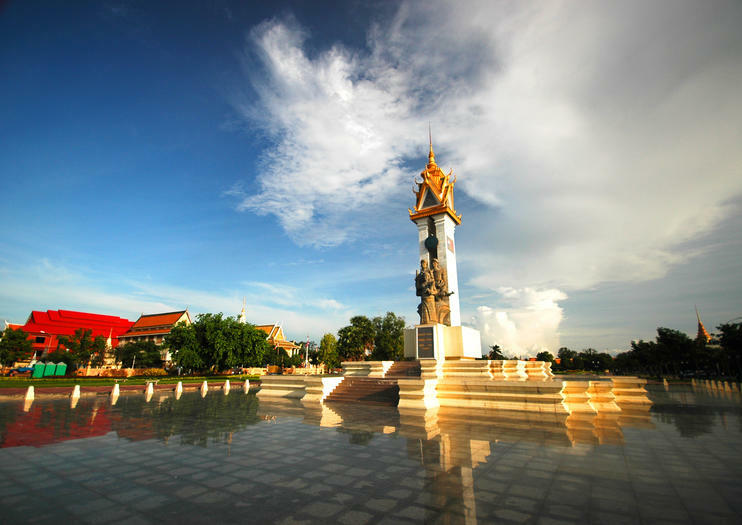 Located at the Botum Park near the center of Phnom Penh, not far from the Royal Palace, the monument is an interesting piece of history as it was built by the Communist regime that took power after the Cambodian-Vietnamese War and overthrew the leadership of the Khmer Rouge. The Khmer Rouge was the ruling party that caused the atrocities that can be witnessed at Tuol Sleng Prison and the Killing Fields. Featuring statues of Vietnamese and Cambodian soldiers, along with a woman and baby representing Cambodian civilians, in the "Socialist realist" style developed in the Soviet Union in the 1930s, the monument is situated in a popular park in the middle of the city. More than its artistic value or architecture, the monument has occasionally become a political focal point for protesters, damaged by hammers, gasoline, fire and even a bomb. The damage has been repaired and the memorial remains an interesting piece of architecture that marks a definitive time in Cambodia’s history. The Cambodian-Vietnam Friendship Monument is located at 25Z Blvd Samdach Sothearos Boulevard, near the corner of Sihanouk Boulevard in the middle of Hun Sen Park. Spend the day learning about Phnom Penh's past and present. Delve into the region's dark history and how it has shaped into the Cambodia of today. Visit somber locations made infamous by the Khmer Rouge and learn about the current politics that continue to move this country. Then, get out of the capital to visit an island on the Mekong, where you'll experience the local way of life along the river.